Accumulating greenhouse gases are causing the climate system of the Earth to move into states that have not been observed in historic time. Computer models of the global atmosphere and ocean are able to simulate these new climate states, but the “pixel” size of these models is large compared to islands. To project local future climate states of our small islands with their steep topography, which strongly affects our climate, special techniques are used to “downscale” these global models. Two approaches have been used in Hawai’i to date, each with strengths and weaknesses. Because climate affects virtually all aspects of ecosystems, these downscaled models are essential in planning for climate impacts to conservation efforts and biocultural resources. Intermediate or “impact” models use the downscaled climate projections as inputs to generate potential future stream flows, groundwater recharge, forest extent, and plant and animal distributions. It is these models, rather than climate models per se, that are of most use to conservation managers. However, because all models are approximations and contain assumptions and sources of uncertainty, proper use of these projections requires a degree of caution and an informed awareness of their limitations. Timm, O., and H. F. Diaz. 2009. Synoptic-statistical approach to regional downscaling of IPCC twenty-first-century climate projections: seasonal rainfall over the Hawaiian Islands. Journal of Climate 22:4261–4280. First statistical downscaling effort for Hawai’i. Used a limited number of ground stations and a selected set of global models. Timm O.E., Giambelluca T.W., and H. F. Diaz. 2015. 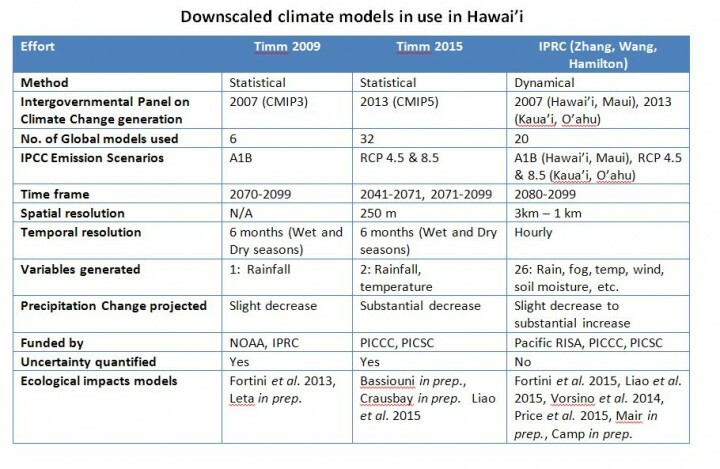 Statistical downscaling of rainfall changes in Hawai‘i based on the CMIP5 global model projections. Journal of Geophysical Research: Atmospheres. 120:92-112. Updated statistical projections using similar method as in 2009, but with many more ground stations, more and newer global models, mid-and end-century periods, and spatial interpolation onto a 250 m grid. Zhang, C., Wang, Y., Hamilton, K., and A. Lauer. 2016. Dynamical Downscaling of the Climate for the Hawaiian Islands. Part I: Present Day. Journal of Climate 29:3027-3048. Describes the dynamical (physics-based computational) model used in the IPRC projections and its ability to simulate recent climate. Part II (in preparation) will describe the future results for Hawai’i and Maui based on the A1B scenario. A further refinement using newer global models and climate scenarios focuses on Kaua’i and O’ahu. Bassiouni, M. In preparation. Development of Statistical Methods to Estimate Baseline and Future Low Flow Characteristics of Ungaged Streams in Hawai`i. Project funded by PICSC. Uses watershed characteristics and past rainfall to estimate future flow in various streams under changed rainfall regimes, using the Timm 2015 model. Camp, R., Brinck, K., Berkowitz, P., Jacobi, J, and R. Loh. In preparation. Assessing projected climate change effects on vegetation management strategies in Hawaii Volcanoes National Park. Project funded by PICSC. Projects future rare species distributions in Special Ecological Areas, using the Zhang model. Crausbay, S., and S. Hotchkiss. 2015. Predicting future distribution of cloud forest and high-elevation species in Hawai‘i: integrating modern and paleoecological data to plan for climate change. Report to PICCC (unpublished). Used species distributions and climate observations to project forest line and forest species mix at mid- and end-century, using the Timm 2015 model. Species distribution models and landscape factors were used to project end-of-century ranges of all native plants, based on the Timm 2009 model. Species distribution models and habitat characteristics were used to project end-of-century ranges of all native forest birds, based on Zhang model. Leta, Olkeba T., El-Kadi, A., Dulai, H., Ghazal, K. In preparation. Watershed hydrological modeling and climate change impact assessment in Oahu island. Creates current and future water budgets for paired leeward and windward O’ahu streams, using the Timm 2009 model. Liao, W., Elison Timm, O., Zhang, C., Atkinson, C. T., LaPointe, D. A., & Samuel, M. D. 2015. Will a warmer and wetter future cause extinction of native Hawaiian forest birds? Global Change Biology 21: 4342-4352. Model of disease transmission among forest birds, using projections from both the Timm and Zhang models. Mair, A., Bassiouni, M., and A. Johnson. In preparation. Groundwater Recharge on Maui: Assessing the Effects of Climate, Land-Use, and Land-Cover Change. Project funded by Pacific RISA. Combines land cover scenarios, climate change from the Zhang model, and a groundwater recharge model to project changes in groundwater availability on Maui. Uses regression analysis to model future dominant species of trees under future temperature and moisture regimes, using the Zhang model. Model of future range changes for a suite of problem weeds using the Zhang model.